Trade Show PR is a project of Avandy GmbH, an all-round public relations agency; please take a look at the list of their services here. We are here to provide full PR support to foreign companies exhibiting in German trade shows. We are also here to save you time, hassle and money. We identify the opportunities and make sure you take advantage of them. We adapt your communications to the requirements of the Germans, so that your message is understood correctly. We take care of distributing that message to the right audience, without wasting time and funds on unnecessary, surplus or ineffective measures. We prepare and train your staff to avoid communication pitfalls. And finally, we are always there to advise you and provide continuous support before, during and long after the show. It is YOUR choice when to start using us. We can join in at any point; however, the later we start, the higher the risk of having to accept the circumstances instead of defining them. Experience tells us that in order to create an effective trade show PR strategy and implement it, companies usually need to start at least 4-5 months before the show date (please keep in mind that good and effective Trade Show Public Relations is much more than just creating press packs and having them in your booth). Please take a look at what we can do for you and your business here. 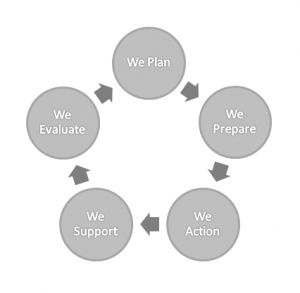 Our services cover the whole process, but we have divided them into 5 stages: Planning, Preparation, Action, Support and Evaluation. We strongly believe that integrity is key to any successful business. All actions, all written and digital material, all parts of information spread by your company should be consistent and send out the same message. In order to help you with that we have arranged some most vital services into packages – please take a look at them here.